Most popular at the CNE-now you can bring these delectable treats to your next event! (including Mars, Kit Kat, Coffee Crisp, Aero, Caramilk, Oreos, Twinkies, and much more). 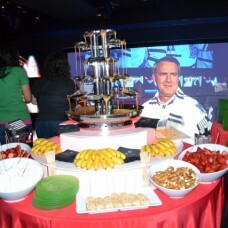 Guests can then top with a variety of sauces and toppings. November 28, 2011Deep fried sweet treats! September 26, 2011DCF all over Toronto this weekend- also the launch of Deep Fried Sweet Food!